getcalc.com's average of two numbers calculator to find what is the mean or average value of two positive numbers. The sum of given two numbers divided by 2 is the average of 2 numbers. 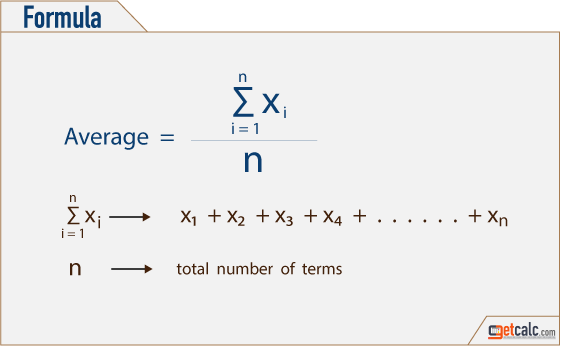 The corresponding formulas, example & workout students, teachers, parents or professionals to learn, teach or execute the average calculation between 2 numbers. How to calculate an average of two numbers? The below solved example with step by step calculation shows user to know how to find what is the average of 2 numbers. Example: Find an average of numbers 70 and 90? step 1 : Address the formula, input parameters & values. step 2 : Find the sum of the given numbers. step 3 : Divide the sum by 2 to get the average. What is an average of 25 and 100? What is an average of 70 and 100? What is an average of 60 and 80? What is an average of 80 and 95? What is an average of 60 and 77? What is an average of 120 and 160?